10 Amp Electric 18 IN. 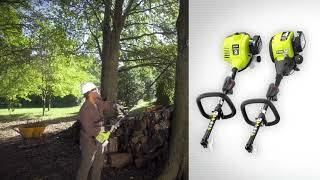 Attachment Capable String Trimmer is rated 4.7 out of 5 by 154. Rated 5 out of 5 by dbryce from Great Machine Looked at reviews on many corded trimmers but they all had problems with line feed mechanisms or poor quality workmanship. This one had all 5 star reviews. It is a bump system (which I like) and a unique string replacement system that is quick and so easy. It is a little heavier than what I am used to but that is reflected in the high quality of workmanship and materials. The price was only a few dollars higher than the junk I almost bought from a different vendor. So glad I decided to get this. 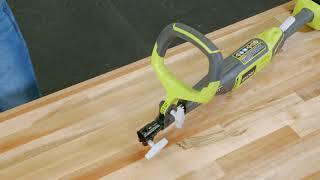 It is powerful, easy to use, comes mostly assembled, and the head unit will fit a variety of other Ryobi tools. Ryobi did a great job designing this tool. Rated 3 out of 5 by jiml1000 from Too heavy and too long I used this for the first time today and really struggled. The tool is very heavy for an electric trimmer and I'm pretty sure my wife won't be able to use it because of the length and weight. I'm 6' tall and it was too long to get at the right angle needed for edging. I think a curved shaft would have been better. I bought because I liked the fact that it is easy to wind the line and uses .080 line, but the line was constantly getting too short and the bump feature doesn't work that well. In order to bump on the ground it has to be at full speed and tap a few times, which causes it to leave a bare spot on the ground where you tap. I'm hoping I'll get used to this but so far, i'm not happy. Rated 4 out of 5 by Old but slow from Decided to live with a corded trimmer/edger Bought this trimmer and the Expand-It edger. I've had several smaller B&D units in the past but was always frustrated with their limited power and durability. 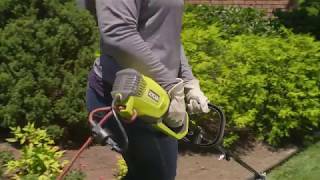 Looked into buying a gas trimmer and edger but found so many bad reviews of everything on the market and decided to go with this Ryobi 10 amp MODEL: #RY41135. It is heavier by far than my old ones but more powerful. I tried both tools out today with very wet soil and had some struggles with the edger loading up with mud. Other than that everything worked well. I'll finish up after it dries out a bit more in the northwest. Rated 5 out of 5 by nema_1 from Great Replacement I bought this a month ago to replace a 3/8 Horse Power trimmer for which parts are no longer available. That one was a bear and so is this one. It cuts the toughest of growth without even hesitating! With the 18" cut you can get the job done in no time. It might look like overkill but having an overrated machine gives you the extra reserve power when you need it the most. The Cons: A strap would have been nice as it is a little heavy after a while and the cord retainer isn't the best. Other than that it works for me and only time will tell how reliable it will be. The name has been around a while and I put my trust in it. Rated 4 out of 5 by Lynn C from Great Multi-Tool Bought this a few weeks ago to replace a gasoline powered unit that had become troublesome (They all do eventually). The string trimmer is very good at horizontal plane work, but really did not do well as an edging tool for my thick San Augustine lawn. So I looked up the edger tool, and that combination really makes edging quick and easy. I now have the proverbial right tools for the job, and I could not be more happy...and all for less money than I would have paid for another gasoline unit. The only criticism is that the power head is only one speed. For trimming, I sometimes like a slower speed for more control around trees and other architectural details. Rated 5 out of 5 by captblood from Plug in electric, better value than batteries. I purchased a Ryobi electric stringer almost 20 years ago. Used the string trimmer and the rototiller attachment. That one finally died a few ways ago. Bought the new Ryobi trimmer. more powerful, they improved this great machine. Bonus, all of my old attachments still fit! Why mess around with changing batteries and having 20 to 30 minute operating time. Eventually the batteries wear out and are expensive to replace. I have a large lot and the cord is no problem. Better than the constant maintenance, noise and stink of a gas operated trimmer. Try it, you won"t regret it. Rated 5 out of 5 by PuritanPastor from Excellent Tool In All Regards I bought this to replace a ten year old electric Ryobi string trimmer. This new one is much better in many ways. The motor is more powerful, it has an electric cord versus a plug you attach your cord to, the ergonomics in handling is better, and the string head reloading is superb and extremely easy and quick to do. Overall, this feels, sounds, and appears to be a better designed tool. Well done to the engineers who redesigned it. With regards to operation and performance, it is close to a gas powered unit. I am very impressed with its performance and operation. Hopefully, it will live up to what I have experienced as the Ryobi durability. It is advertised for home use, but it feels and functions like a commercial piece of equipment. This powerful 10 Amp String Trimmer delivers am 18 in. 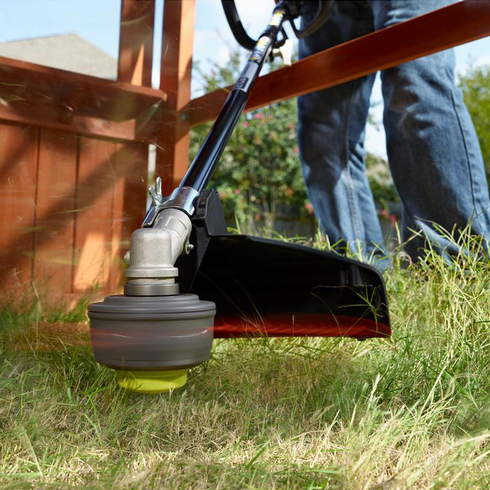 cutting width, allowing you to cut more yard in less time. Not only is this trimmer attachment capable with 10 different EXPAND-IT attachments, it also comes with the REEL-EASY head that reloads in under 60 seconds. Best of all, this String Trimmer is covered under a 3 Year Limited Warranty.